Like the idea of traveling to another country to conduct research? Read on to learn more about the Research Travel Program! Tufts pre-doctoral students have the opportunity to visit the domestic and international headquarters of leading dental manufactures to conduct research with industry scientists. This opportunity allows students to gain insight into the multifaceted and interdisciplinary world of dental product manufacturing. The program fosters understanding and shared information which benefits the participants, their patients, Tufts community, and the profession at large. Students who are interested and have dental materials research experience should apply to the Research Travel Program, find information and the application here! Please read through the qualifications before applying and note the application deadline of Friday June 8, 2018. Any additional questions please contact Katie.Dunn@tufts.edu. ZAMBIA Global Service Learning Program for D19s and D20s! D19s and D20s: Want to travel abroad an volunteer this summer? Check out this new CSL/GSL opportunity culminating in a 3-week field experience in Zambia! ZAMBIA Global Service Learning Program. *If travel interferes with an exam or course responsibility, special permission must be obtained by Academic Affairs and for you to be allowed to make up the requirement, if necessary. Key to this special initiative is that the costs for travel to Zambia and in-country stay are covered through the generosity of the Tisch College Summer Fellows Program. In collaboration with the TUSDM Global Serving Learning department, a new dental service trip to Nicaragua will take place this spring from April 7-15, 2018. The team will travel to Los Robles, Nicaragua and work with a local non-profit organization to provide dental care to patients in a free community clinic. Applications are due Tuesday, January 9, 2018 by 11:59pm. Please contact Alicia Kim (Alicia.Kim@tufts.edu) with questions. This August, the Student Hispanic Dental Association will be taking its annual global service learning trip to Santo Domingo, Dominican Republic, to provide dental care to the surrounding local community that has little to no access to dental care. We have will been fundraising all year to be able to travel with 23 students and 6 faculty members to provide comprehensive dental care. For 1 week, we will be providing dental exams, cleanings, fillings, and extractions as needed, as well as providing everyone with toothbrushes, toothpaste, floss, and oral hygiene instruction and reinforcement. It is an extremely rewarding, uplifting experience as well as a very unique opportunity to offer our services as full-time dental providers to a community in need. As a team of Tufts Dental students, it is challenging to afford this trip, and we would greatly appreciate any donation that you are able to make – large or small. The link below will direct you to our GoFundMe Page. Your contribution would mean the world to us. Every penny counts! Thank you so much for your support and for sharing our passion by being a part of this truly amazing cause!!! As I stepped foot off the plane, I could already see the need within the community in the poorest country in the western hemisphere. Haiti has endured several natural disasters and political instability. Within Haiti, there are approximately 300 dentists for 10.32 million people. After meeting with the dean at the University of Haiti dental school and hearing that, I was in shock. We are needed more than I could imagine, and our presence couldn’t be more welcomed. After arriving in the remote town of Leogane, I knew the people there most likely had not seen a dentist in a long time. We drove down a dirt road through several sugar cane fields just to get to our destination. When we arrived at the Rasin Foundation in Leogane on Thursday morning, there was a crowd of people waiting for us. This made me so happy because this showed that the town was very eager for our arrival and receptive to receiving oral care. Join TUSDM Alumna Stephie Castera (D16) raise money to help hurricane-devastated Haiti! Watch the great video (you get to see Stephie in action!) she made as part of her fundraising campaign for farmers in Haiti and consider contributing! Last year, Stephie Castera, D16 was awarded The Tufts Presidential award for Citizenship and Public Service for outstanding achievement in community service and leadership because of her long and rich commitment to public service as both a ‘citizen of the world’ and as a dental student. Central to her work, was delivering oral health education and support in her home country of Haiti. Today, in response to the devastation left by Hurricane Matthew, Stephie has launched a wonderful fundraising campaign to help. If you or your student organization are looking for a way to contribute money and be assured it is going directly to the Haitian people, this is one way to do it. Please join me — I just bought a goat for a family!! Click HERE to contribute and support a family today! When I first when to Dr. Kim’s pre-trip meeting introducing the Haiti dental service trip, I expected it to be a vacation. I thought about my classmates’ Facebook pictures of them treating patients in an air conditioned modern clinic, trekking in the jungle, and relaxing in the beach. I knew that Haiti was in the Caribbean and when I thought of Caribbean islands, what I pictured were tropical resorts. The meeting was introductory, so we didn’t go into details about the trip itself. I should’ve done more research. But I was a 3rd year dental student at the moment, so I was more preoccupied with successfully finishing my first denture case and studying for my implant exam the following week. On the night before leaving to Haiti, I remember packing my bathing suit and sunglasses in my suitcase. I was glad that I forgot to pack my beach towel, because my bathing suit and sunglasses never left my suitcase throughout the trip. 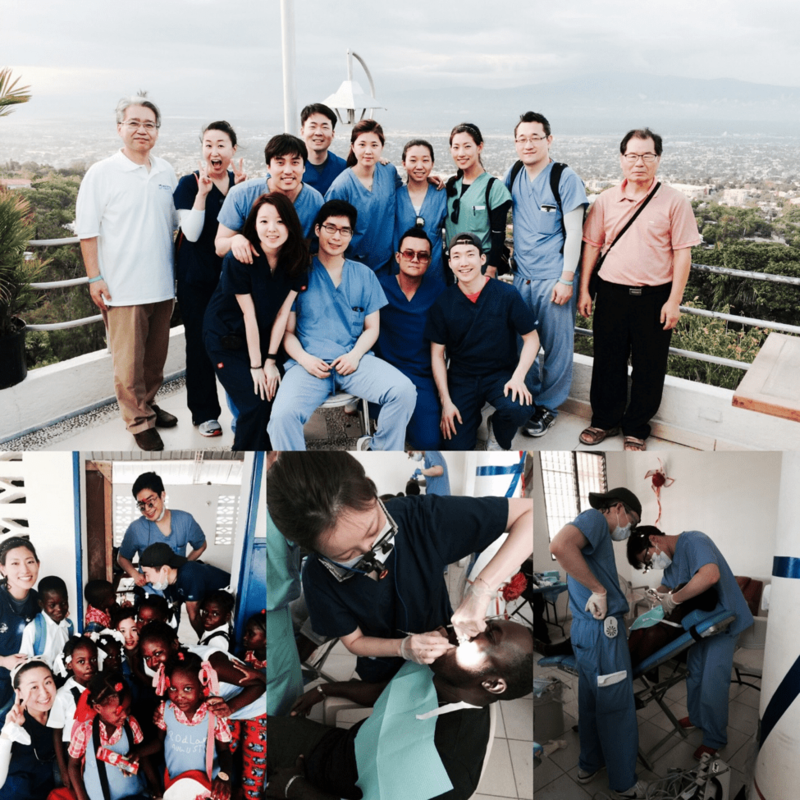 We were in Haiti for only 6 days, so Dr. Kim didn’t waste time. Starting from day 1, we checked the church building that will be used as a clinic the next day and organized dental supplies that we will use the next day into a few bags for easy transportation. The food that our host provided was delicious and the view outside of the window was the exotic landscape of Haiti, not the usual Chinatown streets that I can see from the library windows. Everything just felt perfect the first day. A group of TUSDM students along with a few TUSDM alumni, took a 7 day trip to Port-au-Prince, Haiti this past spring break. As part of KADA (Korean American Dental Association) at TUSDM with the help of Dentist for Humanity, we were able to setup free dental clinic in various towns near Port-au-Prince. As a first year dental student, I was able to observe so many dental treatments up close and was able to interact with patients. One of the most memorable days was day 5 when we visited the Eglise Salut Pour Tous, in Mariana, Loeogane, Haiti. We set up our clinic at the local school and had many young children and students visit us. As soon as we arrived at the school, we were greeted by swarms of young children who had big smiles on their faces. They were chanting and singing as we greeted them one by one. Lots of hugs, kisses, and high-fives were given out. It was a heartwarming and memorable to be around these children and young students. Their giggles and laughter made me forget all about the hot and humid weather we had to endure.